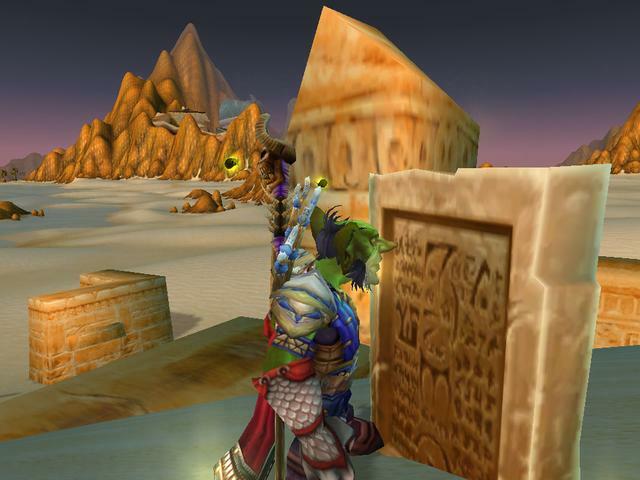 Welcome to out first WoW Dig Site Contest! This contest is a pretty simple one, all you need to do is post a link (with thumbnail if you can) to your best Archaeology-themed Screenshot! You can use any number of image upload services, I recommend imgur personally but any will do. The image/screenshot should be about what you think Archaeology is (or how it can be represented/summarized). Examples) It can be of your character surveying treacherous landscapes or simply a wonderful dig-site shot. Archaeology is your theme! The images will be judged by myself and the community. A top 5 list of screenshots will be posted from all the submissions, which will be then voted upon by the forums members to achieve the top 2 images (after the submission deadline). Everyone is encouraged to participate though. The image does not have to be photoshop'd but altered images are accepted. The image has to follow the forum rules of course, nothing obscene or 'bad'. Only one submission per forum member is allowed. You can edit your post up until the deadline with a different image. "The definition of insanity is doing the exact same thing over and over again and expecting different results". Was lurking for a bit, then made an account and lurked some more. I took a bunch of shots that I liked about archeology. But what to choose? I waited for other submissions so I could post what wasn't like the others... But those other screenshots never came? Anyway, I'll just post a link to them all now! Note: Due date bumped a week to July 10th, tell your friends! Let's get some more entries Looking good so far! What direction do we go from here? Martok wrote: What direction do we go from here? Hello Martok! My apologies for the delay here. Was a busy weekend! Love the picture! I won't lie, I was hoping for a larger turn out but you're still entitled to a prize! Be sure to check your Inbox/messages here on the forums.